"Who remembers sitting by a radio with a tape recorder in hand, making their very own mix tape? And the art of hitting record right after the DJ stopped talking and before the song began....only to find out you didn't like that song, so you had to stop and perfectly rewind it back to the right spot to try again?" Well, did I ever so graciously spew coffee out of my nose and onto my shirt? You betcha. It hurt too. And, of course, I would be wearing white and not my usual black or dark grey ensemble. I mean, of course I would be. I remember the days of recorder to radio like it was yesterday. I lived in the boonies and we didn't have cable or MTV until I was like 15, so this was the way to go; this was the way of life for me. I would sit by the radio for hours after school and on weekends, waiting for that one particular song to come on so I could record it. When it finally did, you prayed that the DJ would stop talking 5 seconds before the lyrics came on so you could record that tiny little bit of intro music before the artist wailed on about whatever. And just when you were thisclose to having the full song, the DJ would cut in 15 seconds before it was over for a station identification and ruin all the hard work you put into it. Your arm was about to fall off from holding the recorder so steady, you were turning blue so you didn't accidentally record your breathing, and you prayed you didn't sneeze, cough, or have anyone knock on your door and interrupt the song. It was enough to make you kick a hole into the bedroom wall. But, if you were lucky - like really, really lucky, on nights that the unicorns danced with the fairies around the virgin fire in the forest, the DJ gods gave you 7 seconds before the song began, it played out all the way to the point it actually went silent on the station's end, no one was in the house to disturb you AND you were allergy-free. I loved when that happened. Then there was the whole issue of cassette tapes. This was a very. big. deal. If you had anything other than the Memorex see-through cassette tapes with the pink, blue and yellow geometric shapes, one would be cast off as a social pariah. It was unacceptable. And God forbid one's Mother bought the brown cassettes with the label already in tact. You'd see friends fainting. I don't care if they were $3 cheaper than the standard Memorex cassettes or that fact that one could get 27 run-of-the-mill tapes for the price of 3, you did NOT buy those. Ever. You sucked it up and had the proper cassettes. End of story. Peer pressure is tough. Thank the Lord above for today's technology. Like so thankful. And thank the Lord for cookies like these. Which will never go out of style. Preheat oven to 350ºF. 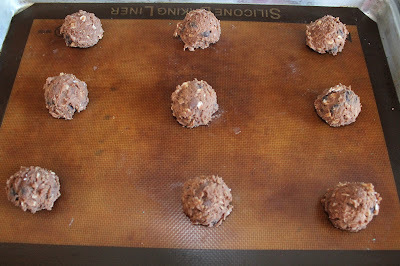 Line 2 cookie sheets with parchment paper or silicone mats. In a mixing bowl, whisk flour, baking soda, and salt together. Set aside. In a separate mixing bowl, cream together butter and brown sugar. Add eggs, one at a time, until blended. Add vanilla. 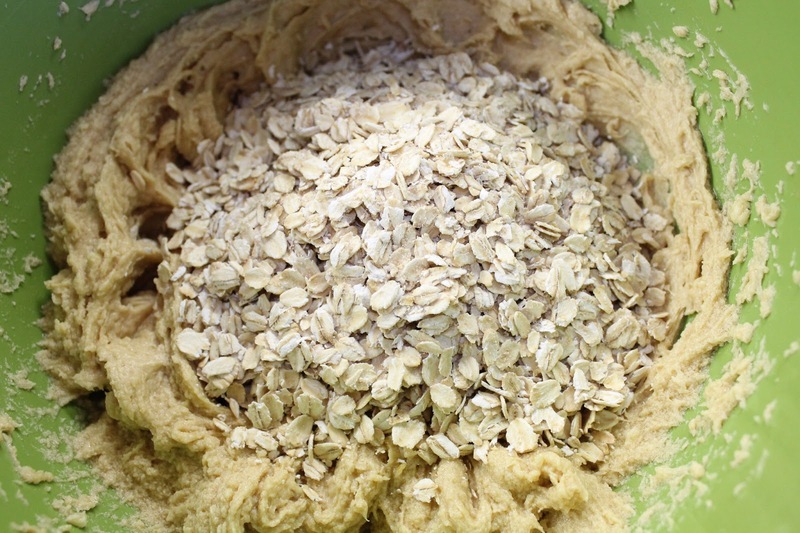 Combine dry ingredients to wet ingredients until blended. 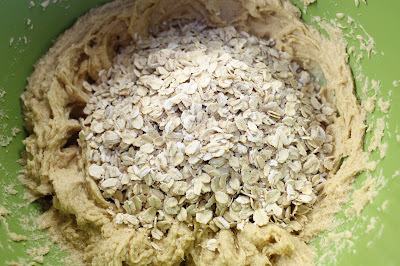 Add in oatmeal. Stir until incorporated. 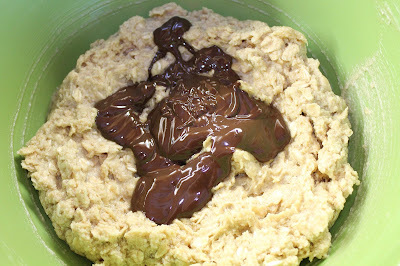 Add in melted chocolate. Mix well. Using an ice cream scoop with a retractable mechanism, place dough on sheets about 2 inches apart. Bake for 8-9 minutes. Do not over bake! Remove from oven. Cookies will be soft, but will come together as they cool. Transfer to a wire rack and allow to cool comepletely. 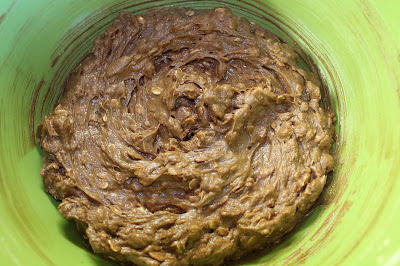 Cookies will stay soft in an airtight container for 3-4 days - if they last that long. 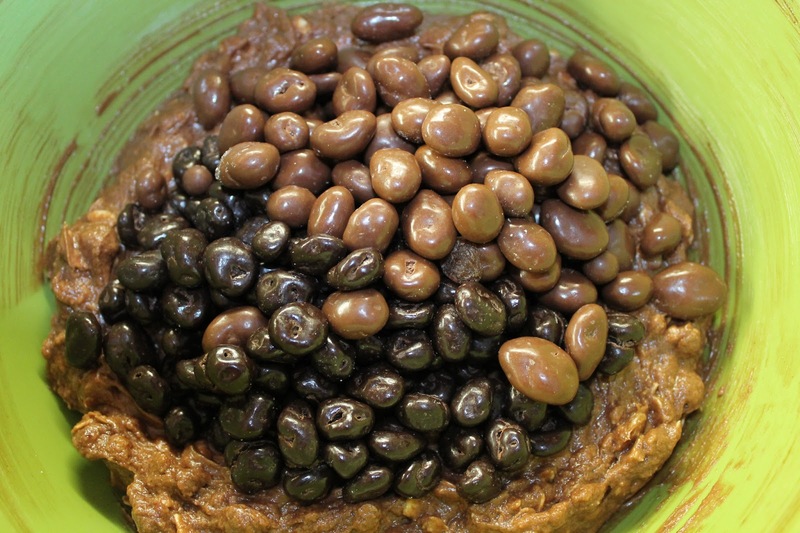 These look really simple to make, but sound very moreish! I reckon I could eat a few of these! 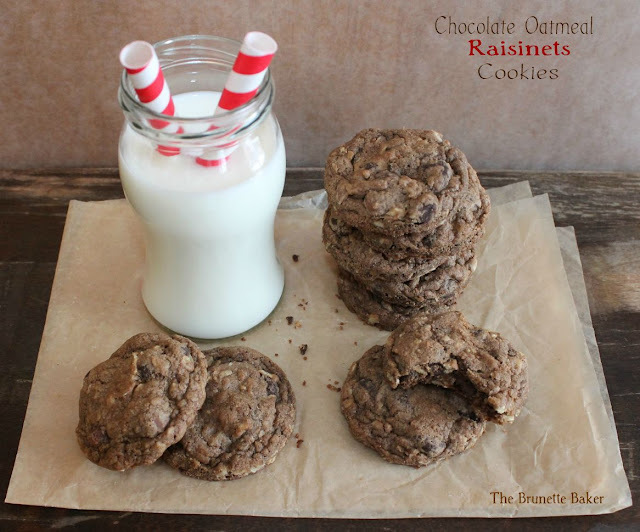 Okay Raisinets... in a cookie - I think I'm in love! Also I love the cassette tape story - those were the days! This is such a great idea! Everyone throws in chocolate chips and/or raisins. This is like a combination of the two. Raisinets and a chewy oatmeal cookie sound like bliss to me. :) Thanks!